These receiving blankets are appropriate for both girls and boys. 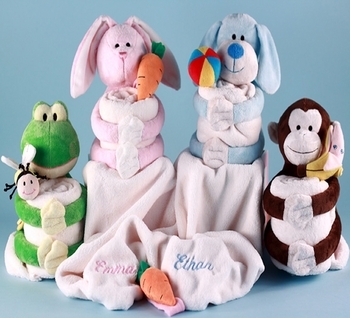 Each comes with a cuddly soft and warm blanket that can be personalized with baby’s name and a plush animal toy. Also included is a plush wrist rattle – a bee, carrot, multi-colored ball or banana – depending on animal selected. Chose either the plush Frog, Bunny, Puppy or Monkey. Comes gift wrapped too!